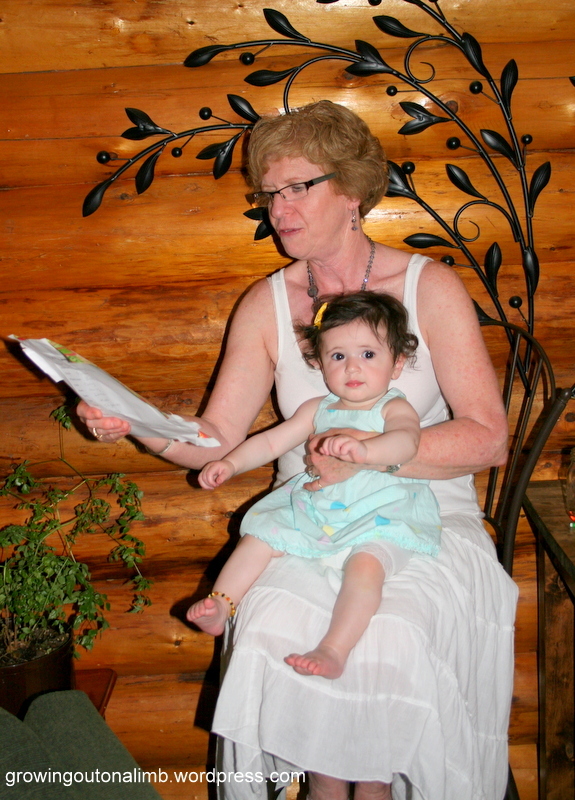 A fun (and delicious) make-busy activity a couple of weeks ago… Eleanor also helped me mix and roll out the cookies! Categories: Craftiness, Eleanor, Emerson, Family Fun, Oliver, Summer! | Permalink. One of Emery’s Christmas gifts was a kit to build a volcano. Over a couple of days Emery built the volcano and put the plaster strips on it. Then he and Oliver painted it (working very well together I might add). Everyone was excited to watch it erupt! It was a fun project and Emery got to build it from the beginning, which I think he really takes pride in. And the volcano is still intact so we can erupt it again if we want! 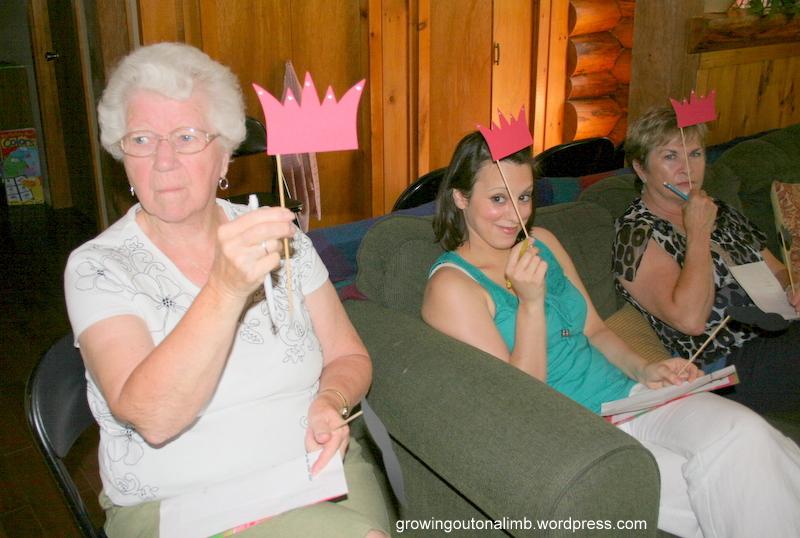 Categories: Craftiness, Emerson, Oliver, Uncategorized | Permalink. 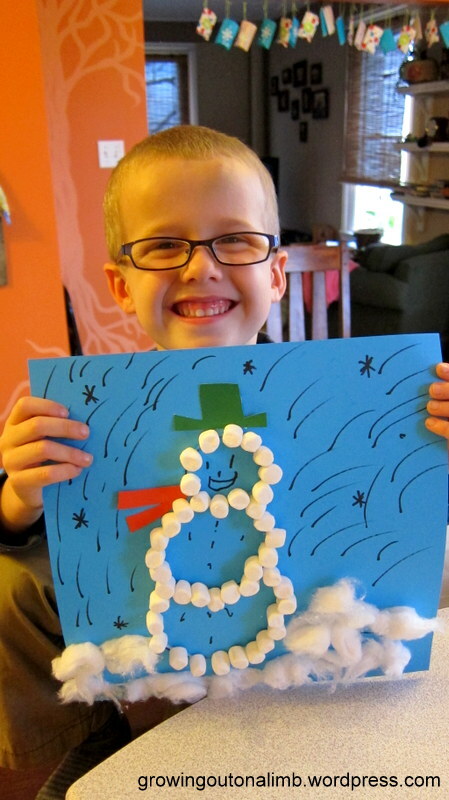 Sometime over the last week or two, Emery learned how to make snowflakes at school! He is pretty proud of each and every one! So on the weekend we tried our hand at circular snowflakes. It took Oliver a few times to figure it out and remember the steps, but once he did he wanted to do it over and over again. 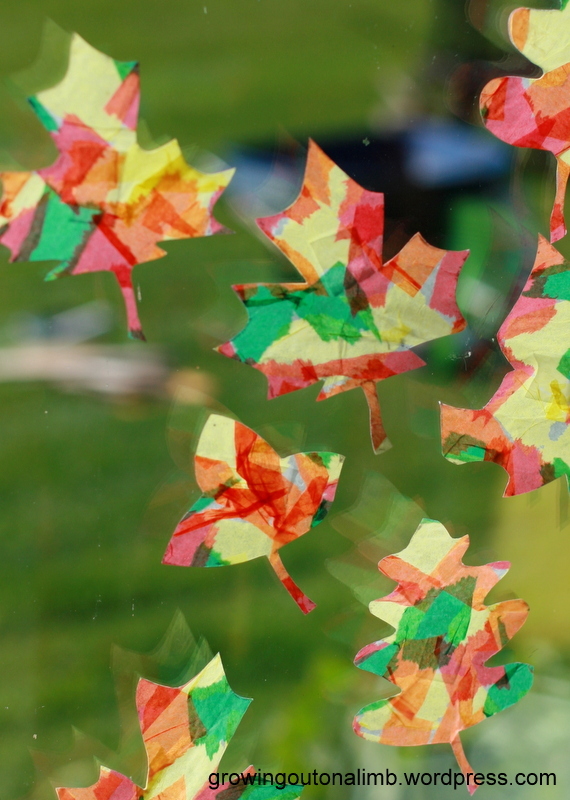 Now we have several very beautiful paper snowflakes adorning our kitchen windows! For two years now I have wanted to do an advent calendar for the boys, one full of activities to do leading up to Christmas (and maybe a chocolate here and there). But the one I’ve had my eye on will take sewing and materials that I don’t have time or room for anymore. And I’m trying to give myself a break this year. So I found these gift card holders (3 for $1), punched a hole in them, and hung them using twine. Inside each is a slip of paper with the day’s activity. #1. 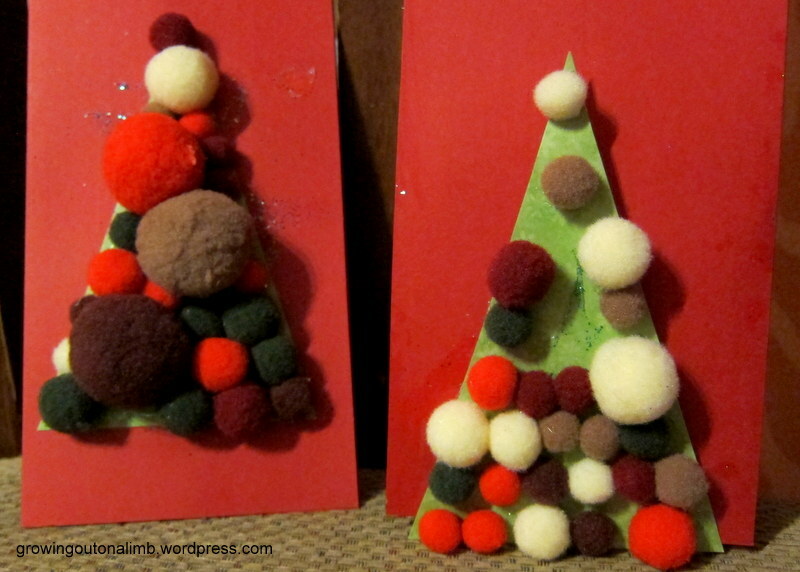 Make pom pom Christmas trees. #2. 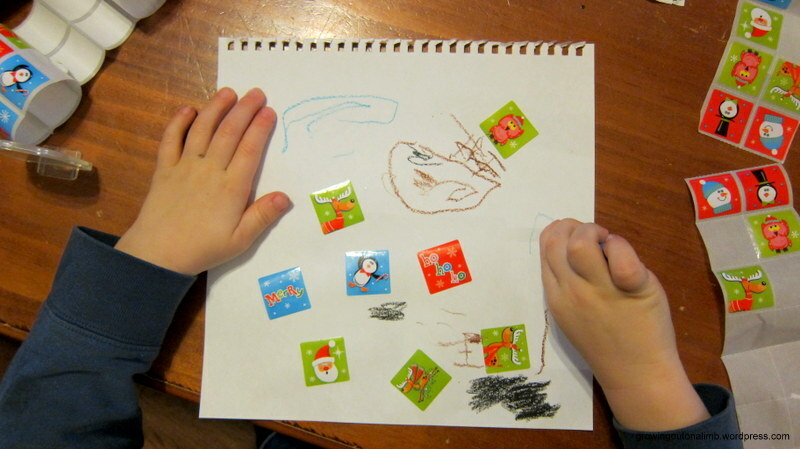 Make a Christmas sticker picture. The boys liked this one! The pictures went right up on their bedroom walls. 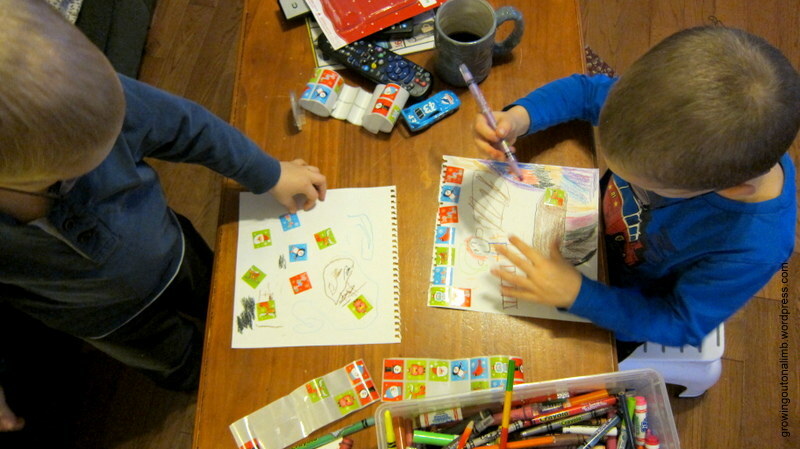 This is Oliver’s and I think he was quite clever, drawing the bodies to go along with the heads in the stickers. See Rudolph, santa (in orange), and santa in his sleigh pulled by three reindeer? #3. Shop for two kids that the boys went to daycare with and whose house burned a few weeks ago. 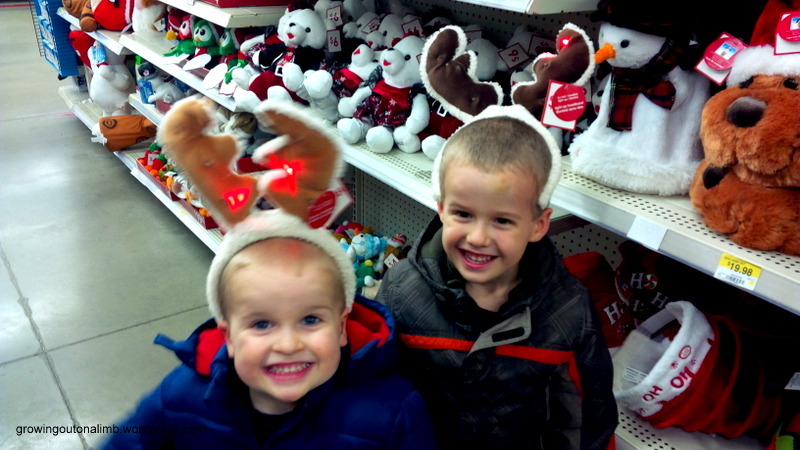 We decided it would be nice to help them out and get them something this year so we made a special trip to walmart. They picked the gifts (with some influence from me), the gift bags, and an ornament for each of them. I know they are a little young for this lesson to hold a ton of weight but helping out a local family is something I’d like to do every year so it will sink in eventually. 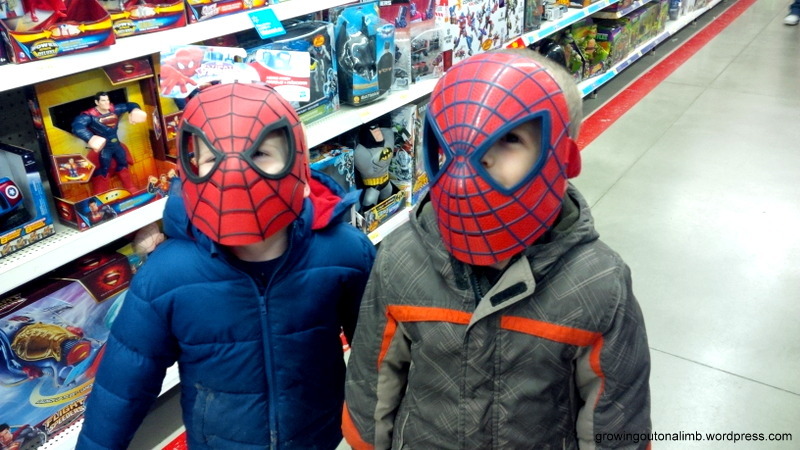 The boys were a tad bit silly in the toy aisle. And again in the Christmas aisle. #4. 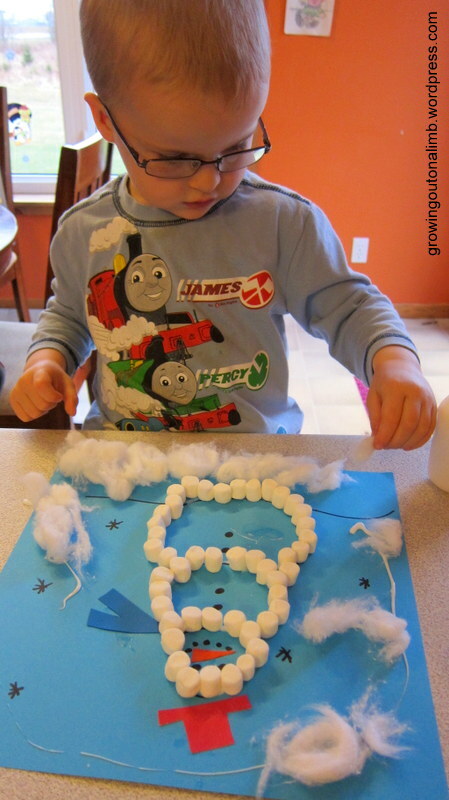 Make a snowman craft. I think the boys liked this one the best so far but it may have been due to munching on stray marshmallows. 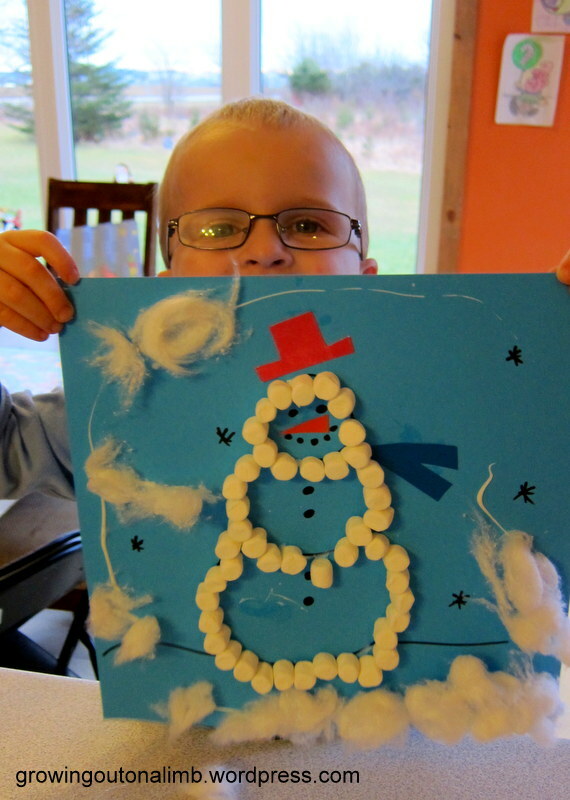 I think these are adorable and worked well with both Emery and Oliver… Emery followed my lead but was able to glue things on himself, while Oliver was able to take a little more creative liberty with the snowman. #5. Read Christmas stories at bedtime. #6. Spend the night with Nana and Papa. #7. Go see the movie Frozen and the Santa Claus Parade. #8. 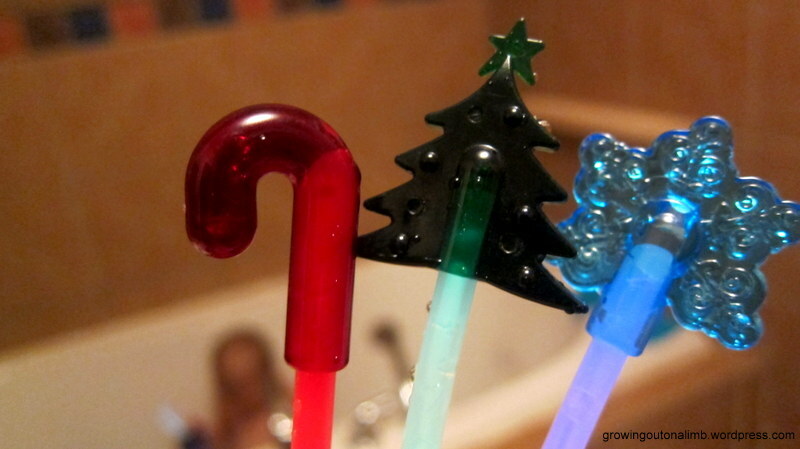 Have a christmas-y glow stick bath. I found these glow sticks with Christmas toppers, cracked them open, and turned out the lights. The boys liked it as much as the first time. #9. Read two new Christmas books. 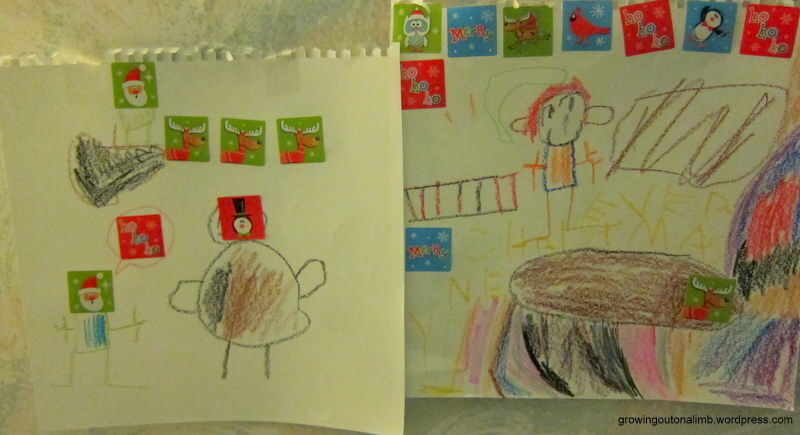 We went with ‘Stick Man’ and ‘How do Dinosaurs say Merry Christmas’… both are really cute and already loved. The boys are pretty excited to open the little envelopes every day so I consider that success and look forward to opening the rest! 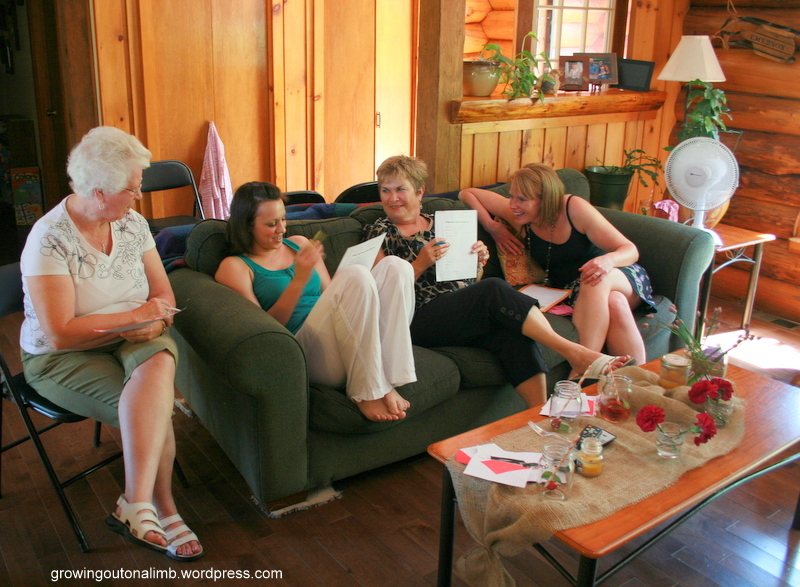 Categories: Craftiness, Emerson, Family Fun, Holidays, Oliver | Permalink. We love a good craft around here, especially when it comes in pumpkin and leaf form. 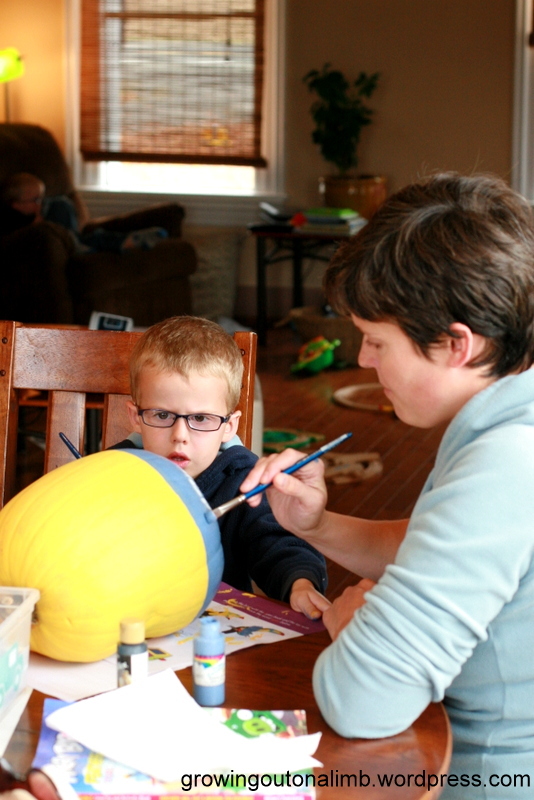 I’m finding crafts are a really good distraction sometimes when home with three kids … almost necessary some days … and there are some really good fall crafts out there. I found this stained glass leaf craft here. 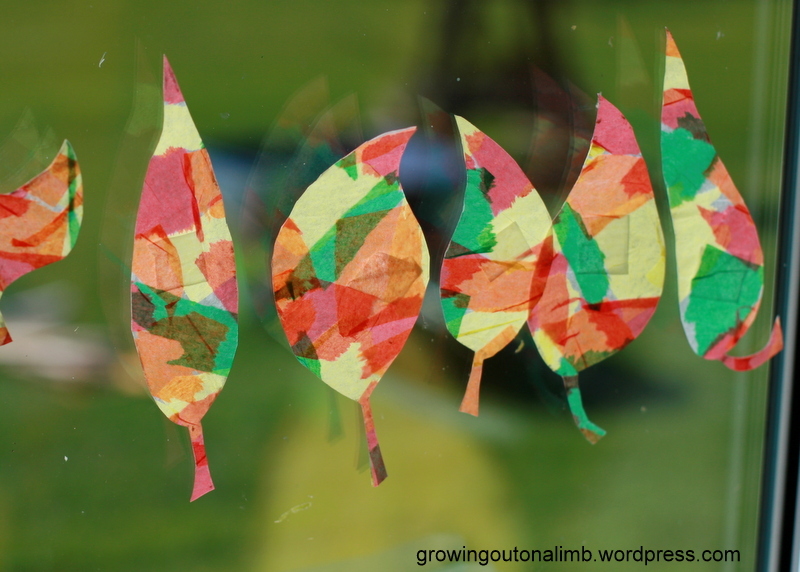 I didn’t put the borders around the leaves but Oliver and I had fun with it and they sure look pretty in the window. I love this time of year and I love carving pumpkins but, since the kids aren’t old enough to carve yet, we look for other ideas. 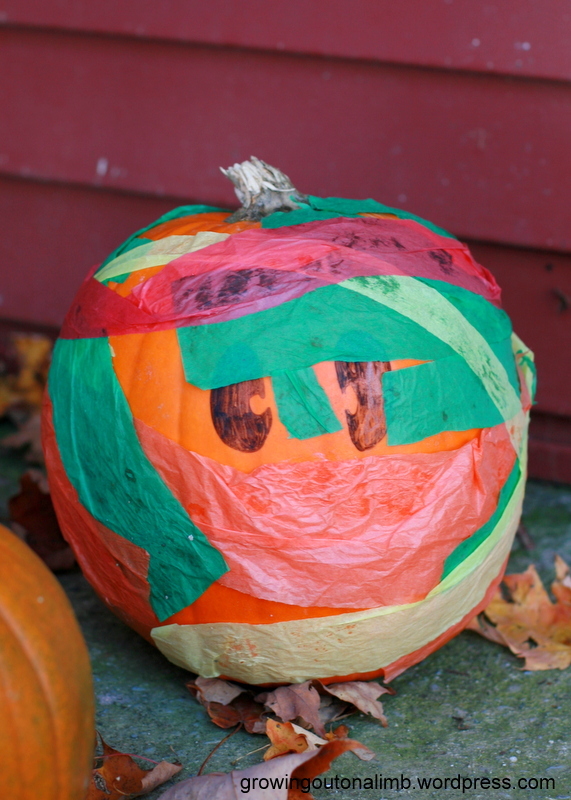 When Oliver was tearing up tissue paper for the leaf craft, he started keeping some of it in long strips and started talking about a mummy pumpkin. I had no idea where it was coming from but he was still talking about it the next day when we picked up the pumpkins. So I drew the eyes and he started gluing the strips of paper. I asked him if he had seen the idea in a book or on TV and he said it was in his own head. I love that he let his creativity take over and led this craft on his own. He is quite proud of it too. Who doesn’t love a minion? 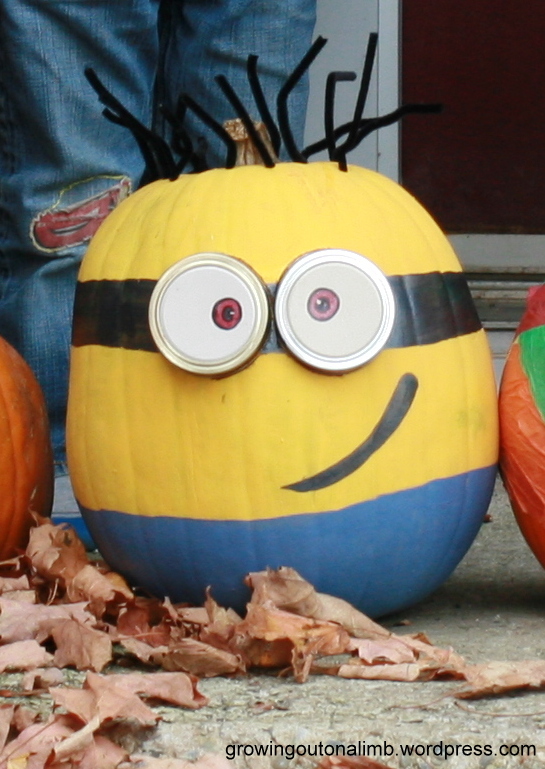 My boys do so when I saw these minion pumpkins I knew we had to have one of our own. 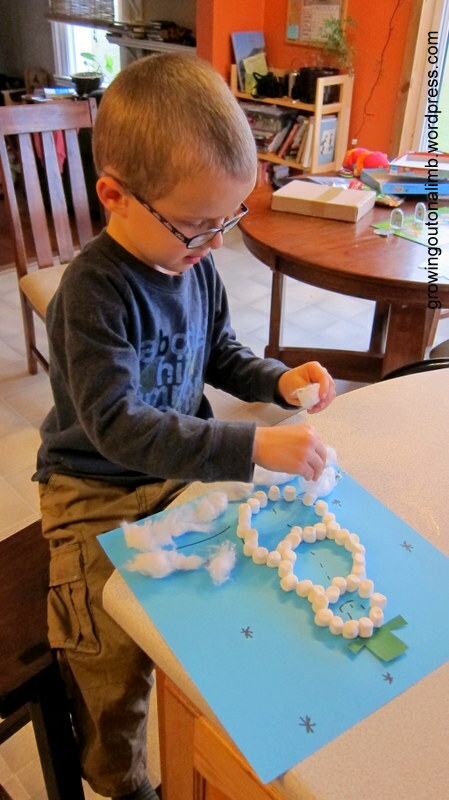 Once we got started I realized that much of this craft was too hard for Oliver yet but we shared the painting and both boys helped me put the pipe cleaner hair in. I think it is adorable and I wish we had time to make a whole family of them. 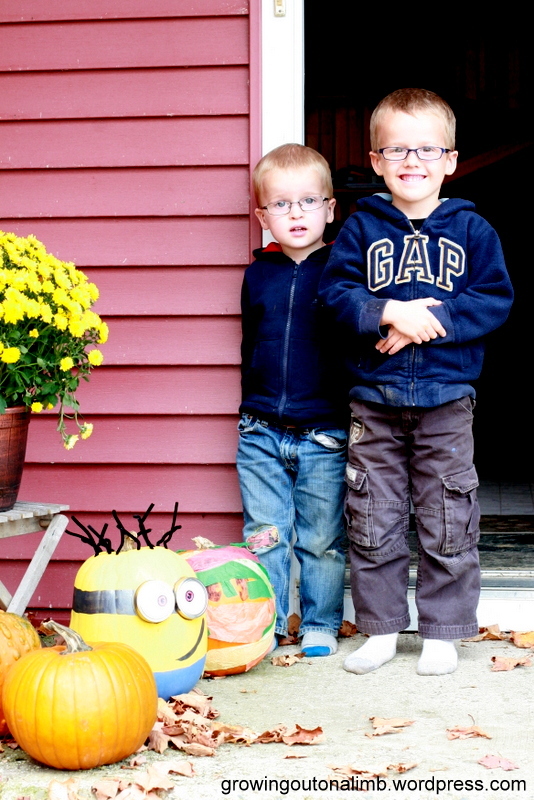 The boys are pretty excited about both pumpkins and about Halloween in general this year. And we are having fun decorating since we’ve never lived in a house where Halloween decorations could be seen and now the boys are big enough to enjoy them. And this one is just for fun. 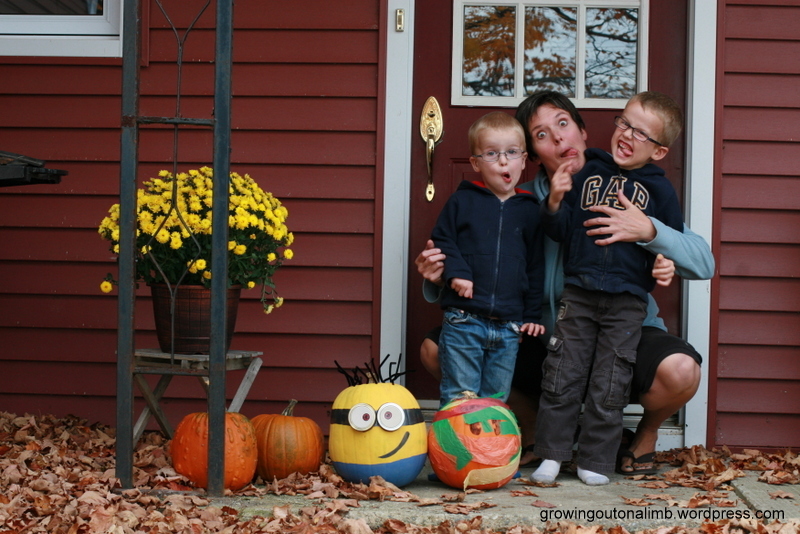 Emery wasn’t feeling real smiley – he has been sick all week – so goofy faces were in order. 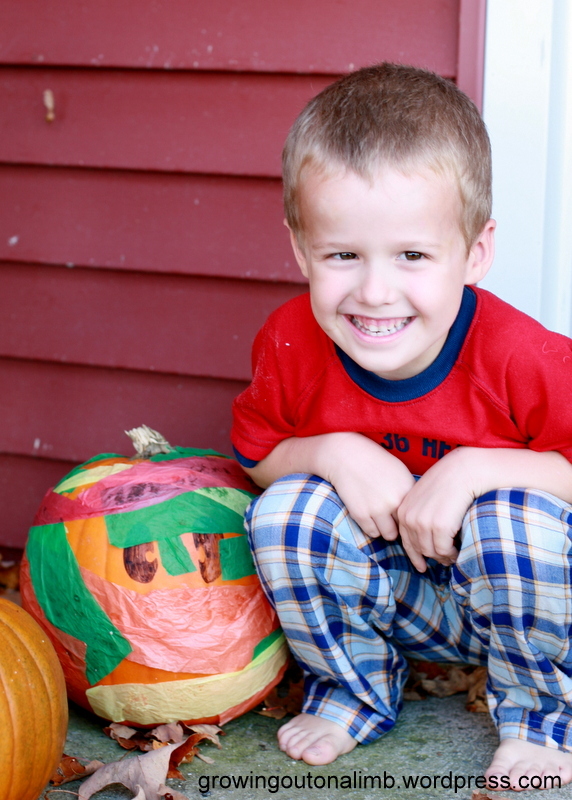 Categories: Craftiness, Emerson, Fall, Family Fun, Holidays, Oliver | Permalink. 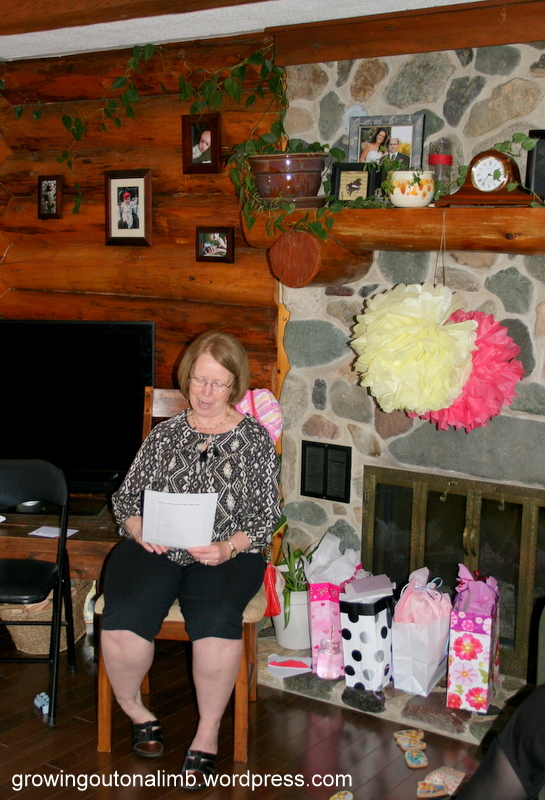 On the weekend I had the pleasure of throwing a bridal shower for my sister, Ali. 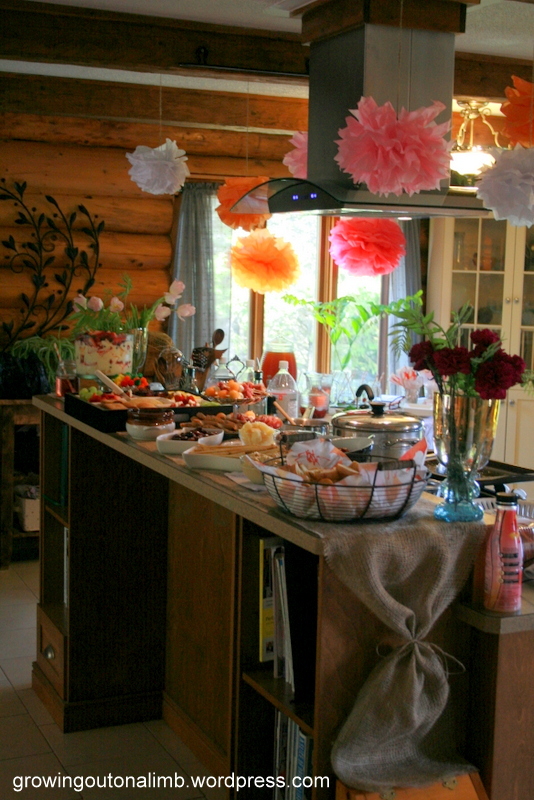 I love planning these types of parties… games, party foods, just the right touch of decorations. I didn’t get a lot of good pictures of the girls because of camera issues. And unfortunately this is the only one I got of the bride. 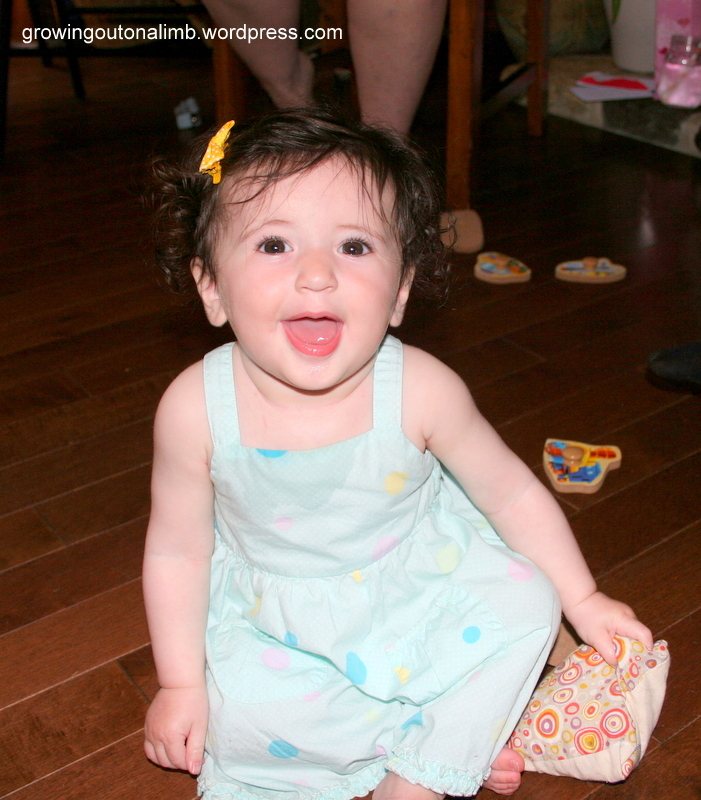 I think everyone would agree that Aaliyah was the cutest party guest! 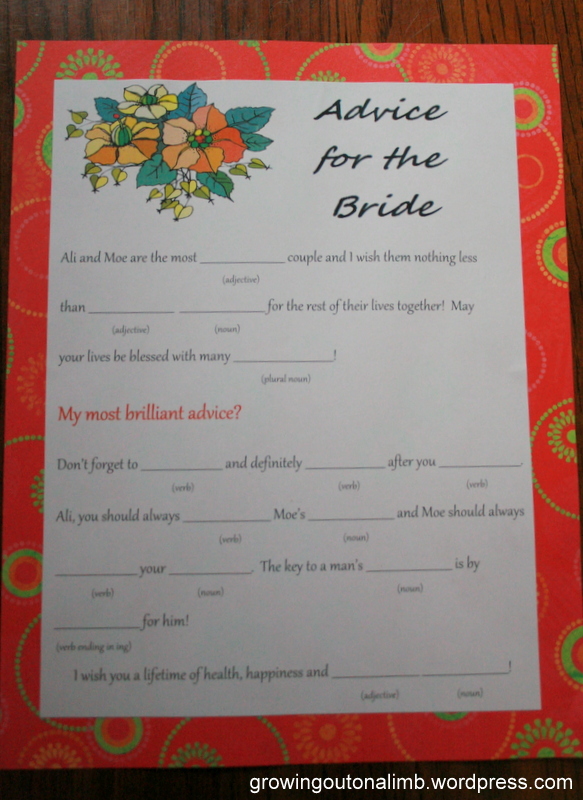 One of the games was a mad libs game that gave Ali some bridal advice. 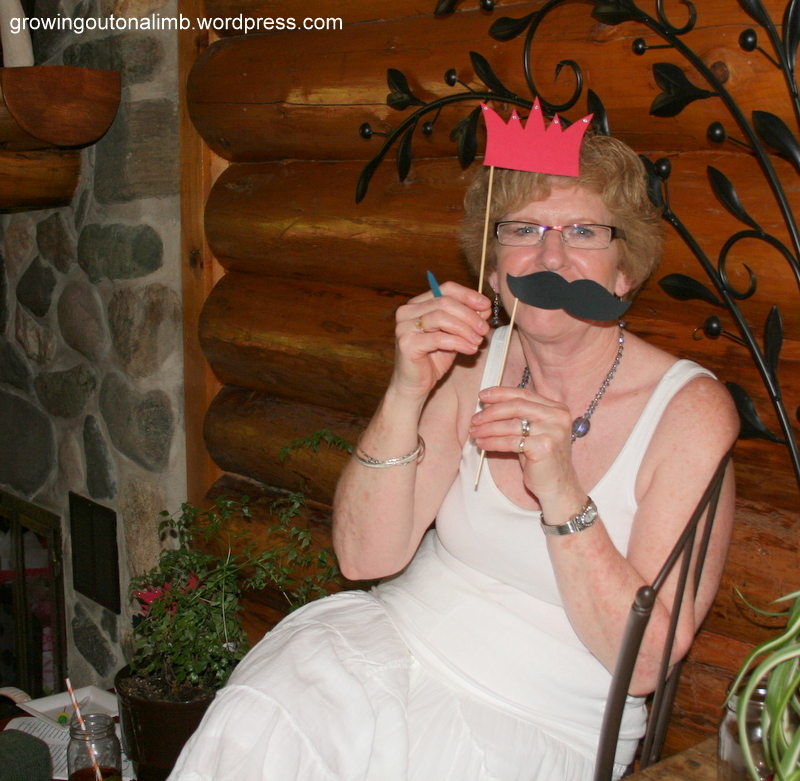 We also played ‘Who Has the Groom’, which is more of a door prize than an actual game. 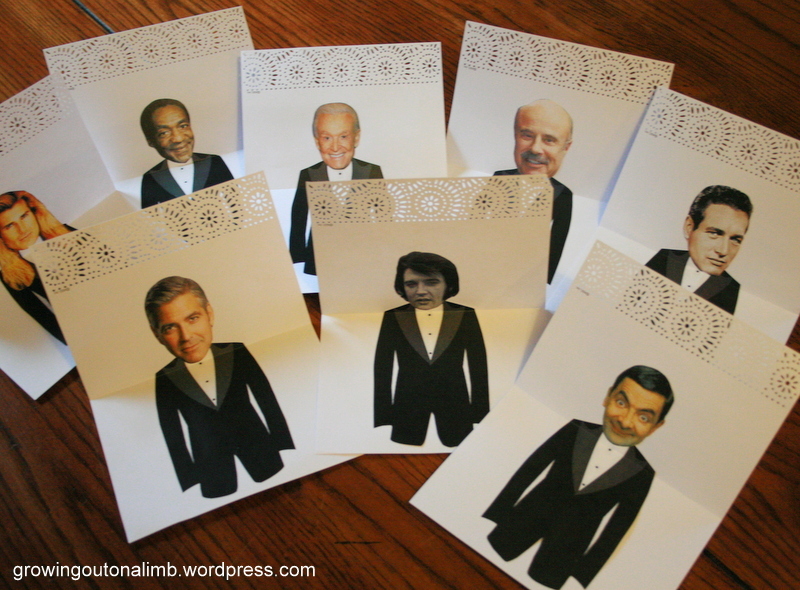 I cut out tuxedos and various celebrity heads (one was the groom’s head) and tucked them into envelopes. Whoever got the groom won the prize! It was pretty funny to see who opened what celebrity. I got Bob Barker and, I have to admit, I wasn’t totally disappointed! The last game was Staches and Tiaras. I asked the bride and groom the same 20 questions each, then read the questions out loud to the party guests and picked one of the answers. If they thought it was the bride’s answer, they put the tiara to their head. If they thought it was the groom’s answer, they put up the stache. This was a fun one too! I love these striped paper straws. I made a lemon iced tea and this pomegranate soda, which was so good. Food! We did a crostini bar with hummus, mango chutney, bruschetta, gruyere, and baked goat cheese, skewers with mango, bocconcini, and prosciutto, a yummy fruit and cookie tray with a lime cream cheese ball, and a lemon and berry trifle that I will most definitely make again. 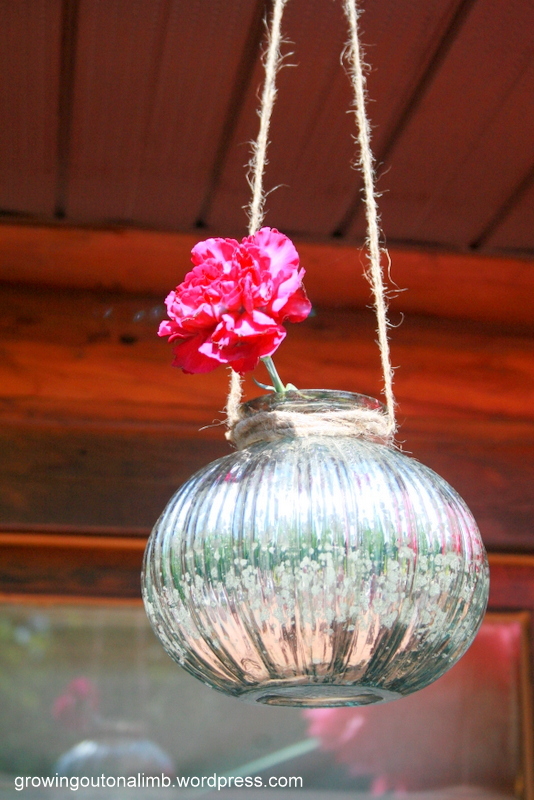 These vases were hung on the deck outside… I bought it when I saw it at Marden’s! 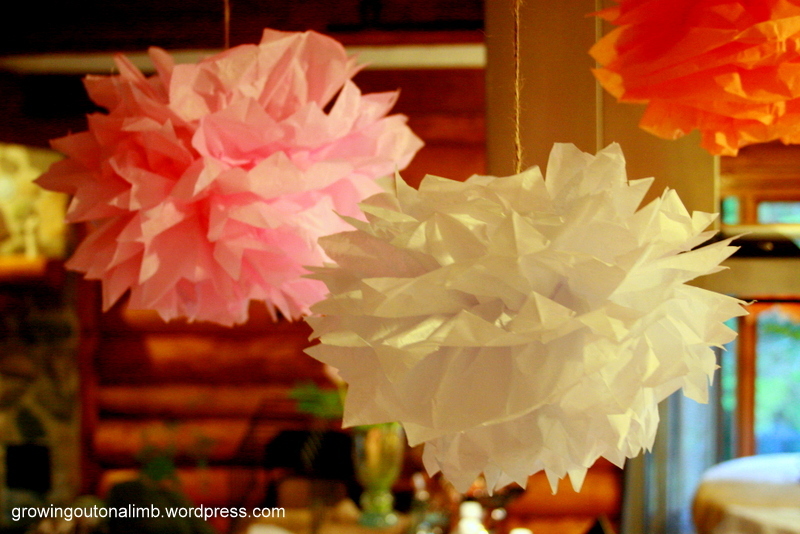 Tissue paper flowers were hung outside and inside, in pink, orange, white, and yellow. 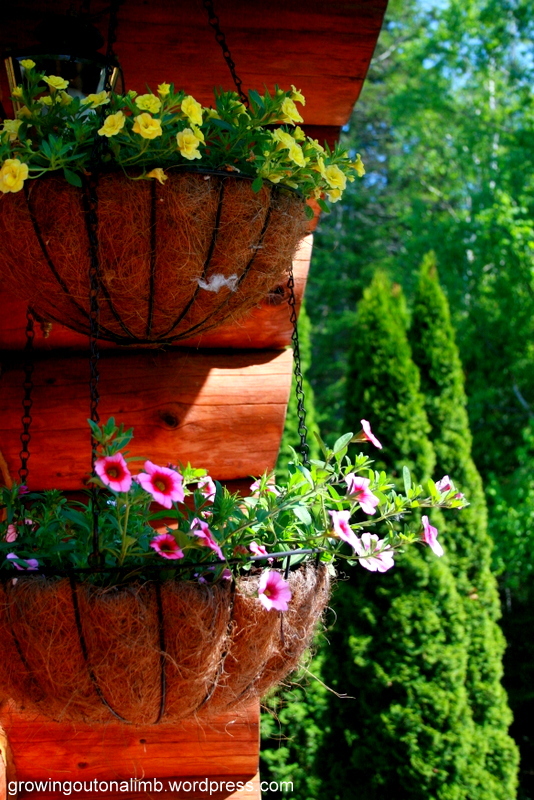 Insert picture of pretty hanging flower basket here (for no good reason other than I think it’s pretty). 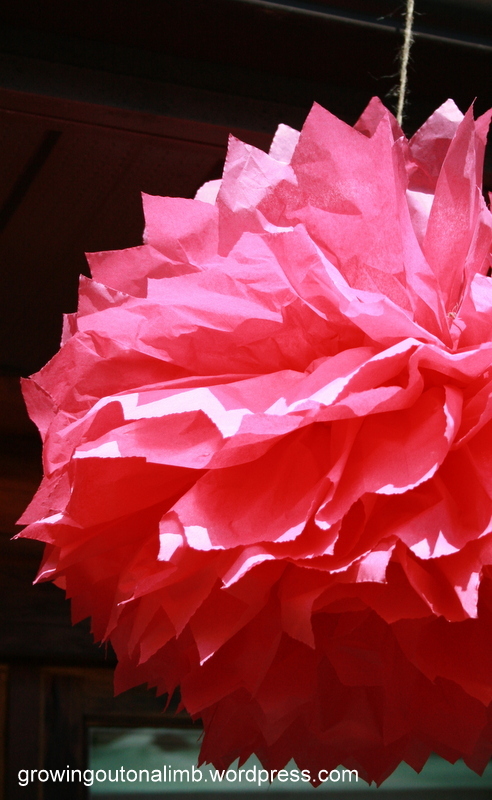 And another shot of the tissue paper flowers hung around the food inside. 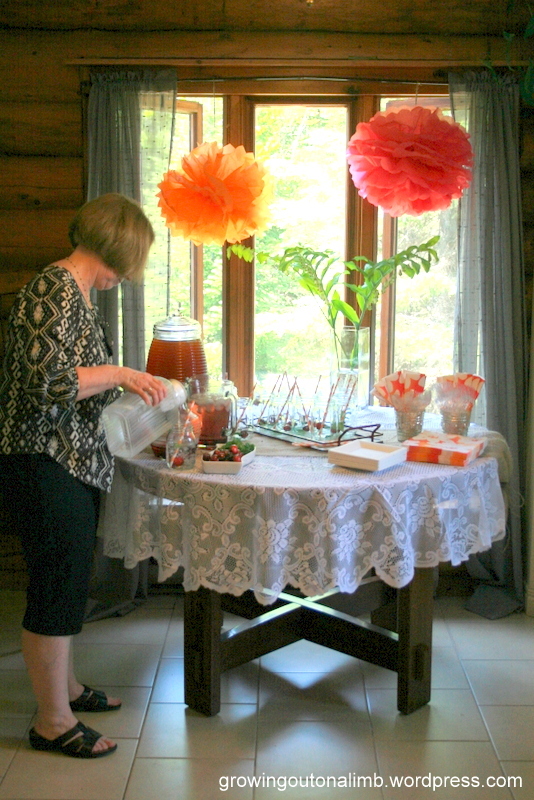 I was honored to host this party for my sweet sister and had so much fun getting ready for it and hosting it. 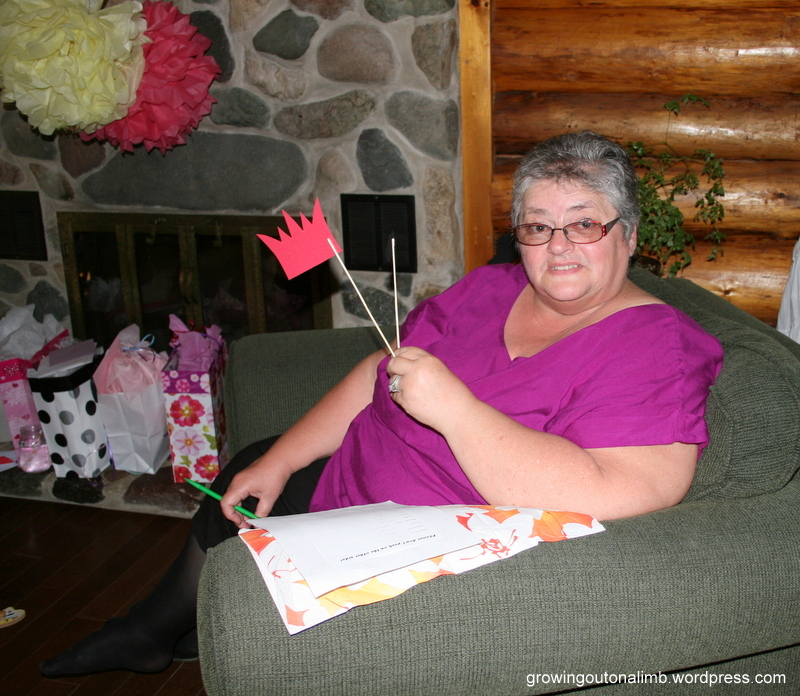 Categories: Craftiness, Special Occasions | Permalink.